In August 1951 a 79-year-old Brisbane woman died and was buried in the Hemmant Cemetery. No headstone marks her grave, no newspaper obituary marked her passing, and her life in Brisbane had been generally unremarkable. Yet Constance Jane McAdam had done much to be remembered for. I first came across Constance while researching the Brisbane Women’s Prison of the 1930s. 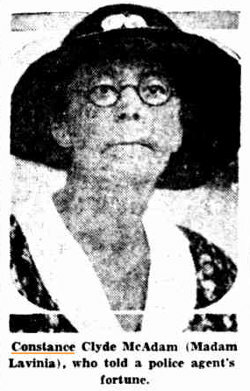 She had spent three weeks in Boggo Road in 1935 after being convicted of ‘pretending to tell fortunes for payment’, and subsequently wrote a newspaper article about her experiences there. From that article, the breadcrumb trail of online information revealed a formidably independent woman who had been a writer in New Zealand, Sydney and London, producing a novel and numerous short stories for newspapers and magazines. In London 1907 she spent time in Holloway Prison for her part in a Suffragette protest at the Houses of Parliament. She even managed to get herself ejected from the New Zealand parliament after a one-person protest there. Clearly this was someone who lived a life worth recalling. That life began in Glasgow, Scotland, in 1872 when she was born as the 11th child of William and Mary Couper. The family emigrated to Dunedin, New Zealand, in 1879. She began her literary career as a young woman writing poetry for the Otago Witness newspaper, and her first paid piece was a short story in the Dunedin Star. She moved to Sydney in 1898, where a major part of her journalistic career was spent writing for the Sydney Bulletin, particularly on the subjects of ‘social, feminist and literary questions’. She wrote under the pen name ‘Constance Clyde’, no doubt a sentimental reference to the river than ran through the city of her birth. She also joined the ‘Yorick Club’, a somewhat bohemian collection of people with ‘a professional interest in literature, visual arts or science’. The novel did not find a large audience and I don’t know if Constance ever tried to write another one. Certainly after this time her output was largely confined to short stories for various newspapers, with the occasional piece of journalism, although in 1933 she co-authored a travel/history book titled New Zealand, Country and People. 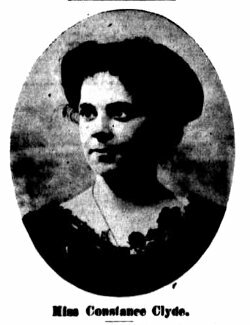 Her political beliefs saw her make the news in 1907. Constance was naturally drawn to the cause of the Suffragettes and their long struggle for full voting rights for women. This led to her arrest and imprisonment in March 1907 for taking part of the first Suffragette protest outside the British parliament – which followed the defeat of another suffrage Bill - in which there was reported to be prolonged fighting between the protesters and the 500 police who were defending the House of Commons. 75 women were arrested that day. Constance wrote vivid newspaper accounts of these experiences, which I will reproduce in the next article on this website. I am unsure as to the direct and ongoing extent of her involvement in the Suffragette movement, and it is clear from her articles that she set out to get arrested just so she could report from inside the 'belly of the beast', but her writings show that she was clearly a very strong supporter of the struggle. Her actions also show that she was not afraid to see the inside of a prison cell, and like many Suffragettes she wore imprisonment as a badge of honour. 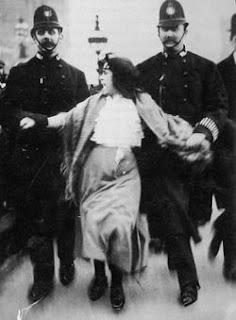 A young Suffragette is arrested at the March 1907 protest. Her life in Edwardian London seemed to become much quieter after this time, and in 1912 it was reported that she ‘was recently received into the Church by the Jesuit Fathers at Farm street, London.’ On the face of it, this appeared to be a surprising move for a person who had railed against the establishment and conformity for so long, but Constance lost none of her political combativeness. Her short stories continued to appear various publications in the following years, but any dreams of literary stardom in London must have faded away. She returned to New Zealand - probably during the 1920s - and continued her love/hate relationship with that country. She was admonished in the pages of the Coffs Harbor Advocate in 1925 - with the suggestion that her ankles should be caned - for her article in the Empire Review criticising the people of New Zealand for their general submissiveness. Then, in 1931, Constance was making news again with another parliamentary protest. This time her concern was child abuse, while the New Zealand parliament was considering a Child Welfare Bill. ‘When the Speaker of the House of Representatives was reading prayers this afternoon a woman in the visitors' gallery suddenly and loudly protested against the Child Welfare Act. An attendant persuaded her to remain silent, but when prayers had concluded she recommenced her protest. She tore up a copy of the Act, throwing it to the floor of the House, She was ejected by the police. The woman stated subsequently that her name was Constance McAdam, and her pen name Constance Clyde. She said she was a member of the Women's International League of Peace and Freedom, and had not been aware that the House opened with prayer. "At all events, I am the first woman to speak in the New Zealand Parliament," she added.’ (Sydney Morning Herald, 19 March 1931). ‘Prominent among New Zealand writers is Constance McAdam Clyde. Articles written by her have appeared in the best English magazines, including the Contemporary and Empire Reviews. Her last publication is a history of New Zealand, in which she collaborated with Alan Mulgan, and which was brought out by Whitcombe and Tombs. Some of her most valuable work has been achieved, however, in assisting to place new writers before the public. Miss Clyde is an ardent advocate of physical culture for both the youthful and middle-aged. She is also, prominent in anti-vivisection matters.’ (Telegraph [Brisbane], 25 June 1932). It was around this time that she moved to Brisbane and settled in the suburb of Dutton Park. This was the time of the Great Depression, and Constance was by now advertising her services in assisting with the preparation and publication of manuscripts, and she also sought a writing partner. However, in June 1933 she was living at ‘Lavinia’, on Dutton Street, Dutton Park, and subtly advertising her services as a fortune teller. Constance also became a writer of regular letters-to-the-editor, usually under her birth name and espousing her views on various subjects. In 1933 she wrote about child protection, prison reform, her opposition to the forced sterilisation of ‘mental deficients’ (which she also wrote about in 1934). She also suggested that people should wear ‘a small piece of pale green ribbon’ on Sundays to show their support for ‘a better state of things financial’. She told the court that 'I thought that I could do some good in this depression by sympathy, kindness and advice, and especially by telling people that there is nothing wrong with this world except the monetary system.' For Constance, even reading tea leaves could become a political platform. True to her word, she refused to pay the fine and so was confined inside the nearby Boggo Road prison for three weeks. She didn’t miss the opportunity to write about this experience, and I have already covered that work in this article. This proved to be Constance’s last brush with the law. Her newspaper letters now became infrequent and her concerns trivial. In a letter to the Women’s Weekly in 1935 she complained of children getting Christmas presents too early. In 1938 she was unhappy with the etiquette of people listening to household radios, and in 1939 she complained of an accident hotspot on Ipswich Road. In 1940, now aged 68 years, she suggested that the government could save money on pensions by asking rich families to help provide for their elderly relatives. In 1944 a rather insipid poem on the tragedies of love appeared in the Queensland Times. And then, nothing. This must have all felt like a long way from the dreams of the ambitious young writer who travelled by ship from Sydney to London in 1903 with an unpublished novel under her arm. In the 1949 Queensland Electoral Roll she was listed as a journalist and living at 15 Deighton Road, South Brisbane. Constance died in Brisbane on 30 August 1951, and was buried in the Hemmant Cemetery. The event passed without mention in the local newspapers. There was no obituary, no funeral notice. It was a quiet end to a life that had petered out in the mundane concerns of suburbia after such an ambitious foray into the bohemian literary circles of turn-of-the-century Sydney and London. Hopefully this article will help make more people aware of the achievements of Constance Jane 'Clyde' McAdam. I set out here to put together the most complete online account of Constance McAdam’s life. While that general aim has been achieved, my research has been limited and holes remain. I would appreciate any further biographical information that can be added above. List of the published writings of Constance McAdam (work in progress). The Game Eileen Played, short story (The Australasian, 5 July 1902). Kirstine Moffat, ‘The Puritan paradox: an annotated bibliography of Puritan and anti-Puritan New Zealand fiction, 1860-1940. Part 2: reactions against Puritanism’, Kotare: New Zealand Notes and Queries, Vol.3, No.2, 2000. Lawrence Jones, ‘Puritanism’, The Oxford Companion to New Zealand Literature, ed. Roger Robinson and Nelson Wattie, Melbourne, Auckland: Oxford University Press, 1998, p.130.